For many people who spend a lot of hours on their computer, whether for casual use or business purposes, it’s a valuable and precious item which they can’t do without. That’s why it can be a little bit worrying when toddlers or young children get close to your computer, especially when you’re not 100% sure what they’re going to do when they’re near it. Most of them will be quite fascinated and want to play with the keyboard or move the mouse around. Children and pets are quite good at touching your computer when you don’t really want them to, and when they do could cause something untoward happening. One of the simplest ways of stopping that from happening is to lock down the machine so when a key or mouse button is pressed, nothing happens and your system is safe. Or if you want to show a video or movie on the screen it can’t be interrupted. Here’s a selection of different ways you can lock the keyboard, mouse and even drives or power button from user interaction. These tools are also useful if you want to clean your keyboard and mouse without unplugging from a booted up Windows. KeyFreeze is a very simple tool to use, and all you have to do is install it and when it runs will show a window with a 5 second countdown timer. After the time runs down the window will fade out and then your keyboard and mouse will be locked. As it says in the dialog window, to get back to a usable keyboard and mouse simply press the standard Ctrl+Alt+Del combination and then press Escape or the Cancel button to return to the desktop. KeyFreeze has no options to configure and the only button you can press is to turn the lock on again. Works in Windows XP, Vista and 7. 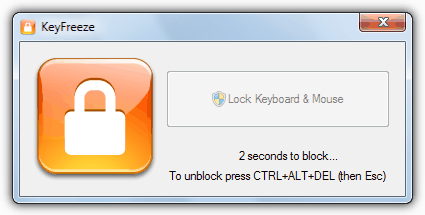 ToddlerTrap is a tiny and very basic tool to lock all keyboard actions and mouse clicks. Run it and you can interact with the programs window but can’t touch anything else. It does have a bit of a disadvantage though, because when you’re using it, the program’s window stays visible at all times. You have to drag it out of the way to stop anyone casually clicking on it because ToddlerTrap is exited and the keyboard and mouse become usable when you click on the X to close the program. If anyone manages to do that by luck or knowing how to, your computer becomes vulnerable again. Holding down a chosen hotkey combination will temporarily allow keyboard or mouse clicks. ToddlerTrap is a simple portable executable programmed in AutoHotkey. 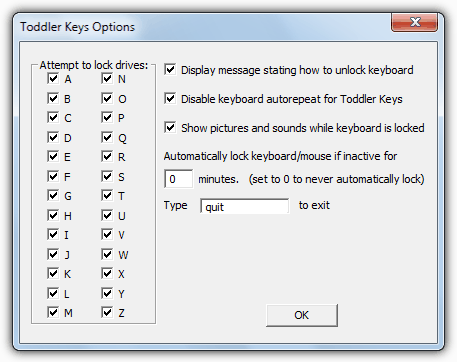 Toddler Keys is quite a feature rich locking program because not only can it do what most other similar tools can do and lock the keyboard and restrict mouse usage, it can stop CD-ROM trays from opening and also disable the Power button (Windows XP only). Another interesting feature is you can add pictures and audio files via a media manager and every time a key is pressed during lock down, a new picture will be displayed and sound will be played. Useful to keep toddlers occupied without affecting Windows! 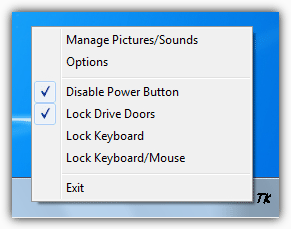 Individual functions can be toggled on or off via the tray icon context menu, and double clicking the icon will enable the lock. To exit the locked screen, just type the word QUIT which can be changed to your liking in the Options window. An autolocking timer can be setup to activate after a certain period of inactivity. Works on Windows XP to Windows 7. 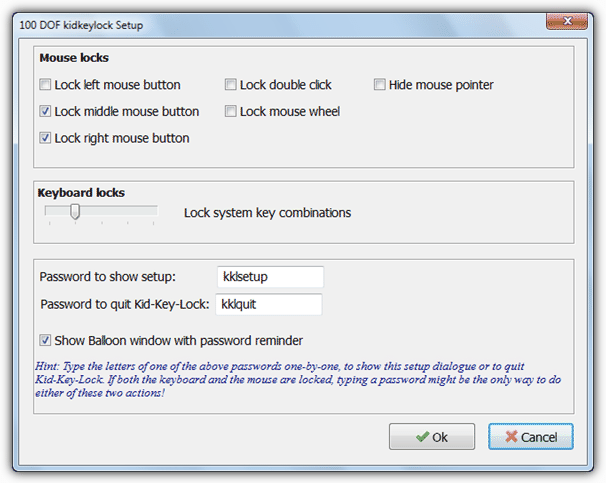 Kid-Key-Lock is a utility to partially or completely disable mouse button and keyboard key functions to lock down things to your liking. For instance you can lock only system key combinations, lock all keys except characters, space and enter, or everything on the keyboard. And for the mouse you can lock individual buttons, double clicks, the scroll wheel and even hide the mouse pointer (although the pointer seemed to stay visible in Windows 7). If you’re going to completely lock keyboard and mouse actions and make the program silent, be sure you know the password to show the setup screen again. Kid-Key-Lock works on Windows 2000 to Windows 7 and there are portable or ad supported installer versions available. I like to video chat on my laptop with my family out of state but my toddlers like to press the keyboard and exit out of everything. Do any of these apps allow a video chat to take place and lock the keyboard at the same time? Hi! you can set the power button to not do anything on windows.. however if you hold down the power button it will force the computer off.. I believe that holding the button down can not be deactivated. Thanks for this advice! I am going on a camping trip this weekend and would like my 13 month old to be entertained by movies on my laptop and this will perfect for her to get her mind off wondering to all other campsites. very nice i tried it with my grandpa. Thanks for the cool tip. Thanks for another great post! I think I’ll give Toddler Keys a try. My toddlers are forever pushing buttons as soon as I leave the room…especially the power button. Well, i use Transparent Screen Locker its fast and efficient and the professional version has many options to play around. This will work nicely for me, with my 2 little ones and their friends.